Sorry that posting has been light the last few weeks. 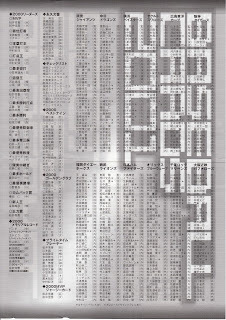 Work's been kind of crazy lately and I've been doing some traveling, both for work and for fun. 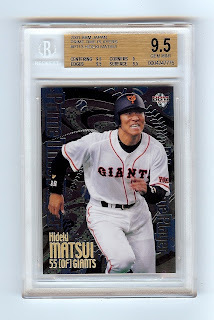 My list of things to post about has been getting longer, so I'll be trying to get caught up in the next couple weeks. 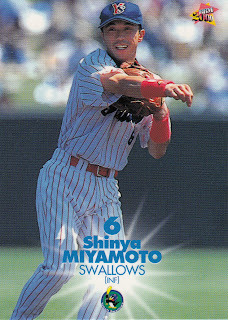 I was at last night's Orioles-Red Sox game and I noticed three people on the field with a connection to Japanese baseball. 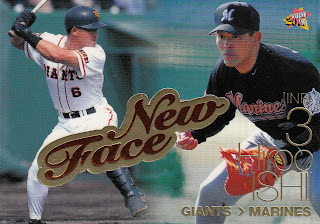 Two of them I expected - Bobby Valentine and Junichi Tazawa - but I hadn't realized until I saw him that Lew Ford was now on the Orioles. 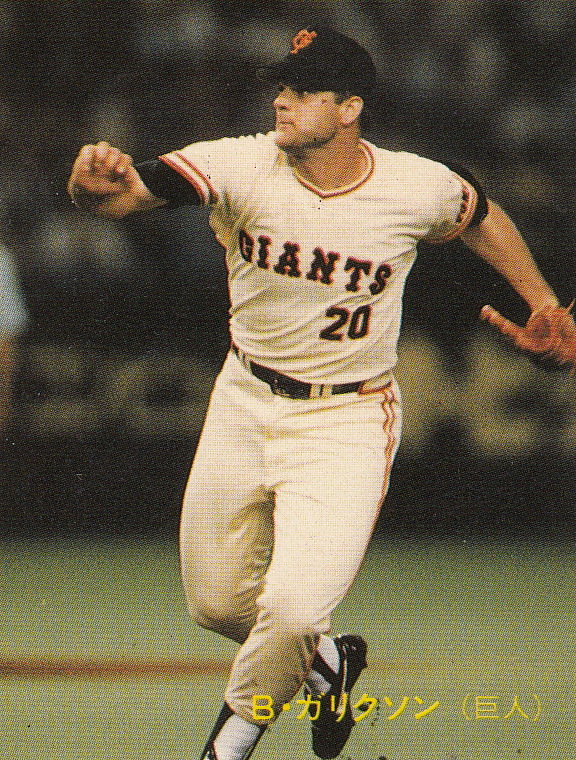 Ford had originally been drafted by the Red Sox in the late '90's, then traded to the Twins who he made the majors with. After being let go by the Twins at the end of the 2007 season, he signed on with the Hanshin Tigers for 2008. He ended up playing in only 47 games with the ichi-gun team, hitting a paltry .225 while spending the rest of the time with the minor league team. 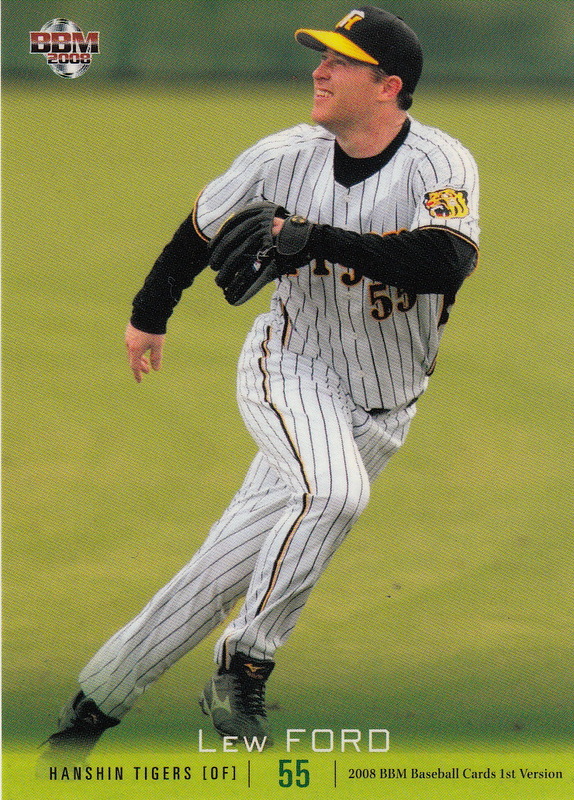 He returned to the States in 2009, splitting time between the Reds' AAA team in Louisville and Long Island in the independent Atlantic League. He spent 2010 in Mexico, then returned to Long Island for 2011. The Orioles picked him up this year and he hit .331 with Norfolk along with stints with the O's. He's 35 years old now, playing in the majors again for the first time since 2007. "Was" is the operative tense here, however. 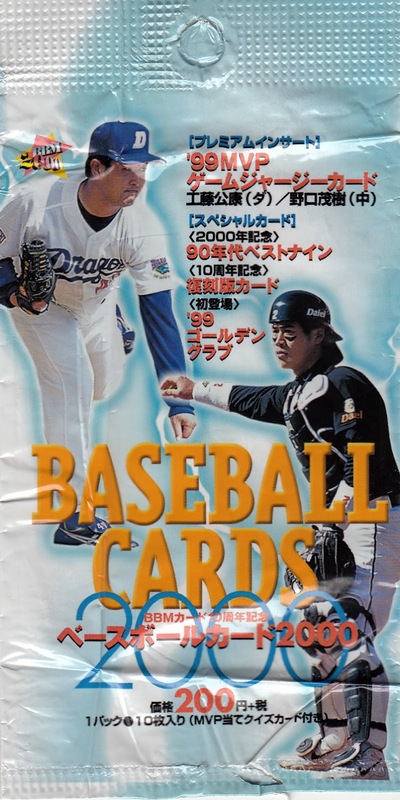 I had asked a question on NBP Tracker a month or so ago about whether the "merger" of Orix and Kintetsu following the 2004 season combined their team histories - I used as an example the question of whether the last time the Orix Buffaloes played in the Nippon Series was 2001 (as Kintetsu) or 1996 (as Orix). 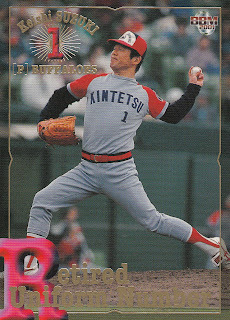 The reply I got was that Kintetsu's history was not included. 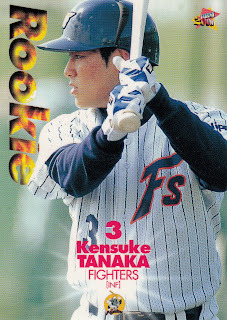 The example the person replying made was that despite the face that Keishi Suzuki's number had been retired by Kintetsu, Mitsutaka Goto is wearing #1 for the Orix Buffaloes (and has since the merger, except for when Terry Collins had the number in 2007 and 2008). 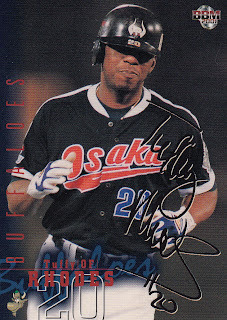 So if Tuffy Rhodes' 55 home runs in 2001 is not the franchise single season home run record, what is? I think it's Atsushi Nagaike with 43 in 1973, but I could be wrong. 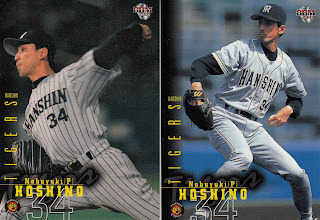 Late Series: Hanshin Tigers (cards 556-597 replaced cards 130-149, 370-389, 515 and 548) and Orix Blue Wave (cards 598-639 replaced cards 210-229, 450-469, 519, and 552). Also all insert and memorabilia cards were replaced with new versions. 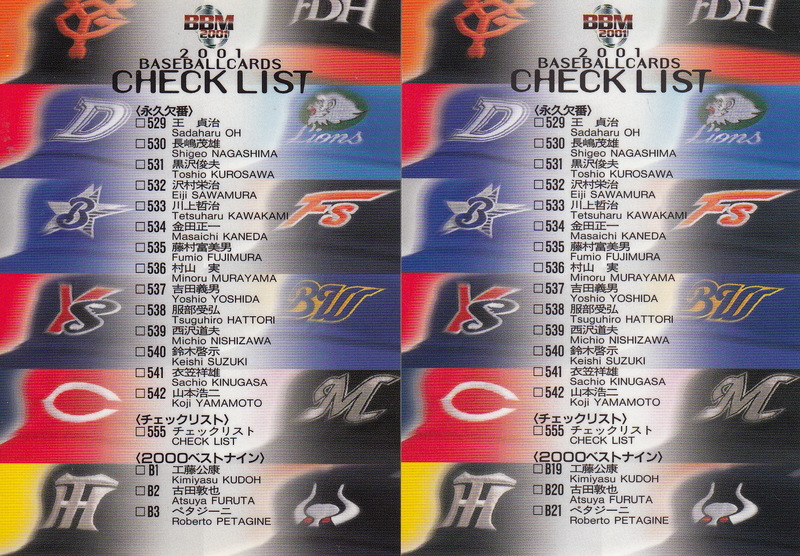 Card #555, a checklist card for the insert and memorabilia cards, was reissued with the updated versions. For the first (and only) time, BBM decided to reissue the insert and memorabilia cards for the Late Series. 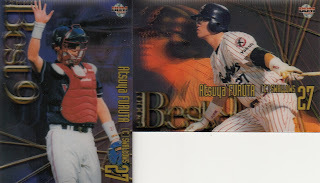 So there are two versions of each 2001 insert and memorabilia card. The Best 9 insert cards were 3D cards similar to the old Kelloggs cards from the 70's. 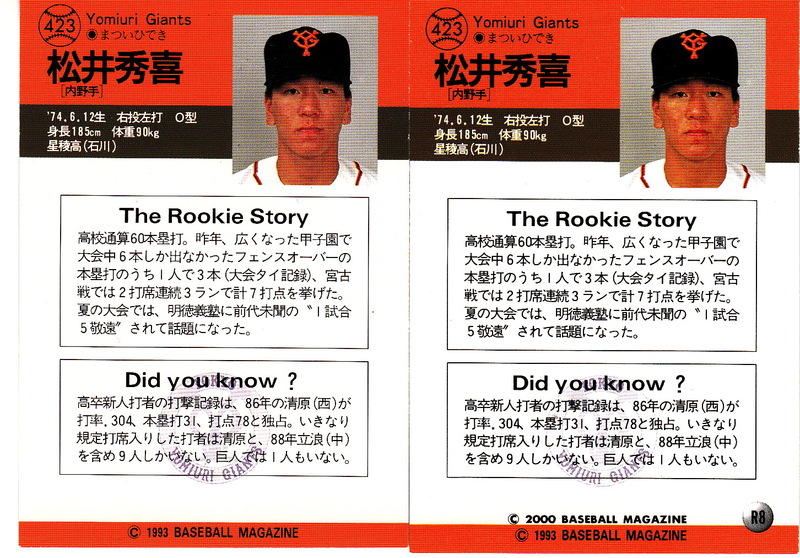 The original cards had a purple background while the Late Series cards had an orange background. 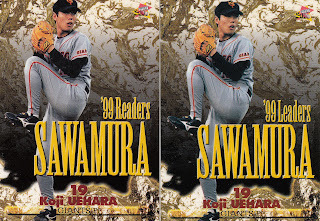 As in 2000, there was a much rarer version of each card available to winners of a mail in contest. The mail in cards were not 3D. As before, I have none of these, but Collecting Ichiro has both versions of the original and Late Series cards of Ichiro. There were only 18 Best 9 cards in each edition (36 total) instead of the normal 19 - Bobby Rose, who was the second baseman for the Central League Best 9, does not have a card. 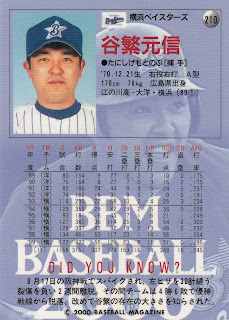 Rose had been unable to come to terms with the BayStars following the 2000 season and (I'm guessing) did not come to terms with BBM for cards in the 2001 set either. 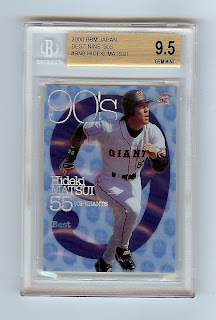 The Golden Glove cards were plastic cards that were semi-transparent. 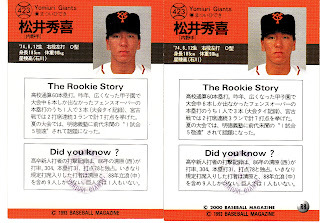 The backs of the original cards had a red background on the biography section and an orange one on the Late Series cards. As with the Best 9 cards, there was a mail in winner version that was not transparent. 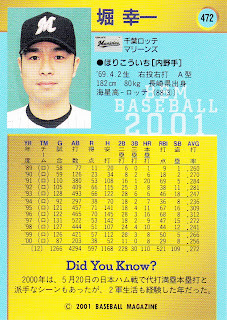 Collecting Ichiro again has both versions of both cards. 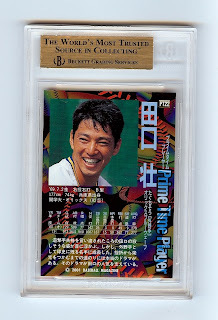 The Prime Time Players insert cards featured one player from each team, once again replacing the original 12 cards with 12 new ones for the Late Series. 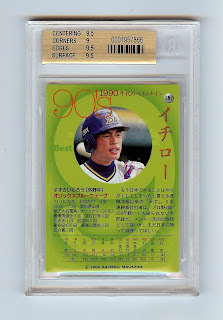 I have none of these cards and since Ichiro had gone to the States in 2001, Collecting Ichiro doesn't have any either. 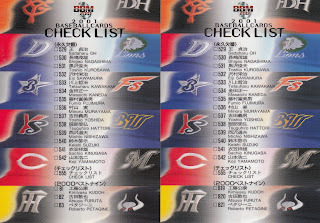 BBM included a checklist card with the 2001 set that listed the insert and memorabilia cards. 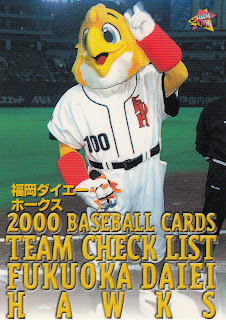 With them replacing these cards for the Late Series, I suspect that they issued a new checklist card. 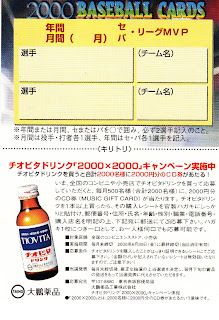 (OK, let me say this the right way. 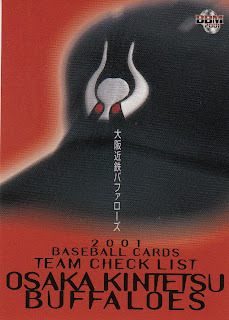 I have a checklist card listing the Late Series insert and memorabilia cards. I suspect that this card replaced one that listed the original insert and memorabilia cards, but I've never seen the original card.) 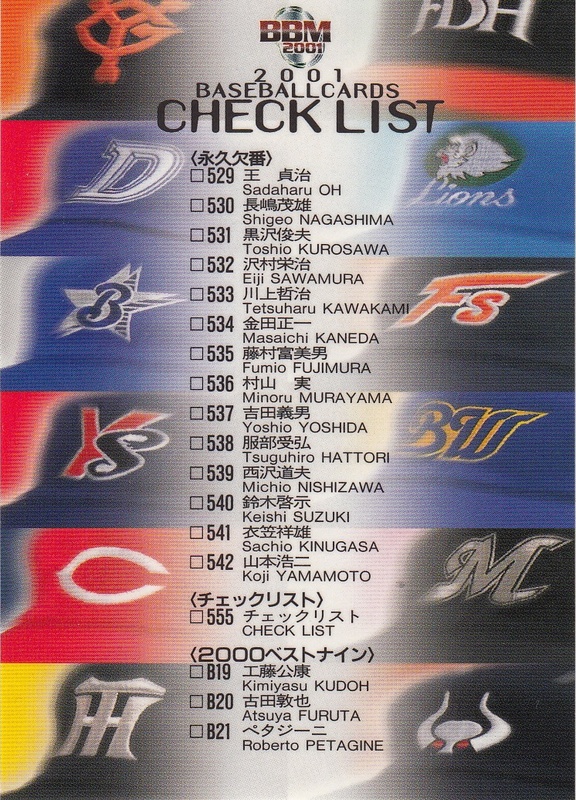 UPDATE - I have now confirmed that yes, the checklist card was updated for the Late Series. 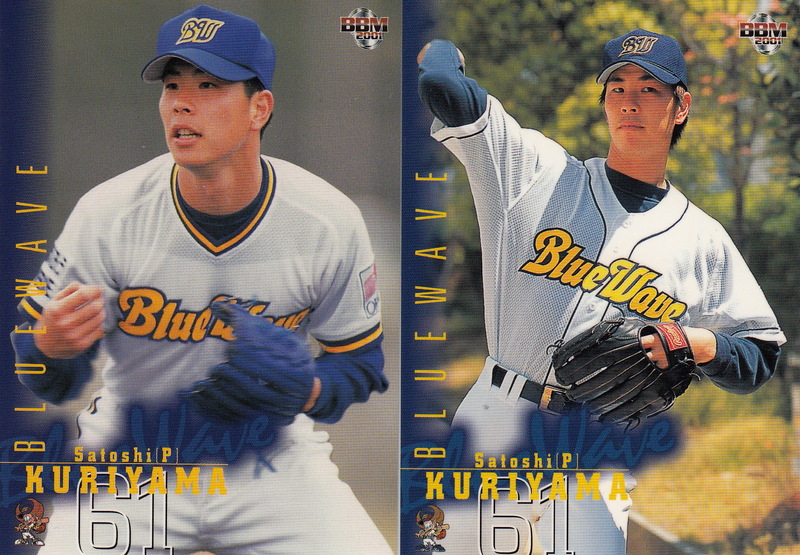 There's a little unusualness about the Leader subset. 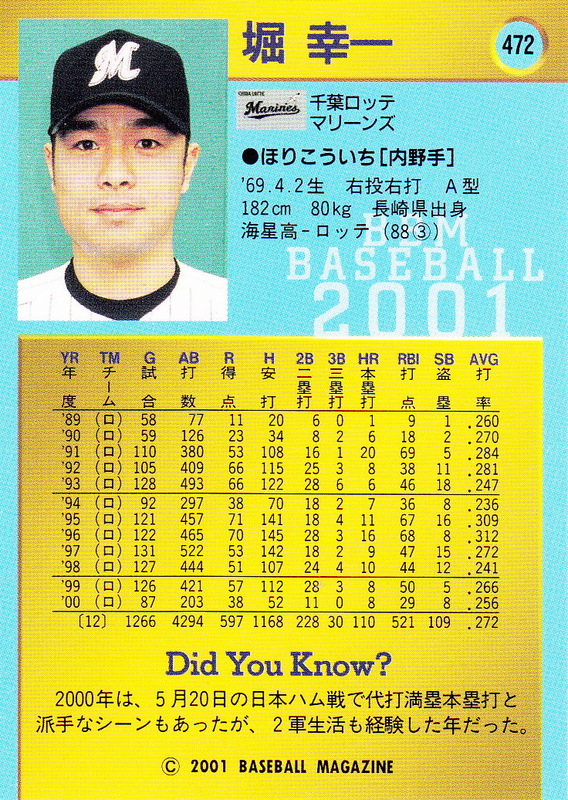 Bobby Rose led the Central League in hits in 2000, but he does not have a card in the subset (or the regular set as well). 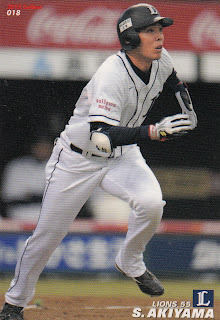 I know that there have been other players who have appeared in the leader subset without appearing in the regular set since they no longer played in Japan (for example, Ichiro has two cards in this edition's subset) so the absence of the Leader card for Rose is odd (but obviously due to the same reason he's not in the Best 9 subset). 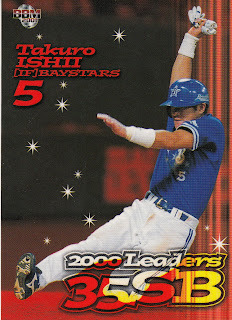 The other odd thing about the 2001 Leader subset is that as far as I can tell it is the only Leader subset to not have a card for the previous year's Nippon Series Champion. 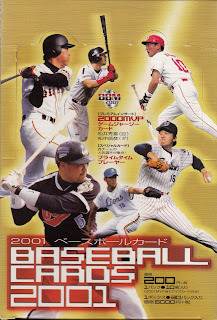 Every set up until 2001 had one and every set after 2001 had one. 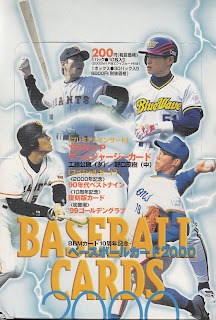 I have no idea why BBM chose not to honor the 2000 Giants. 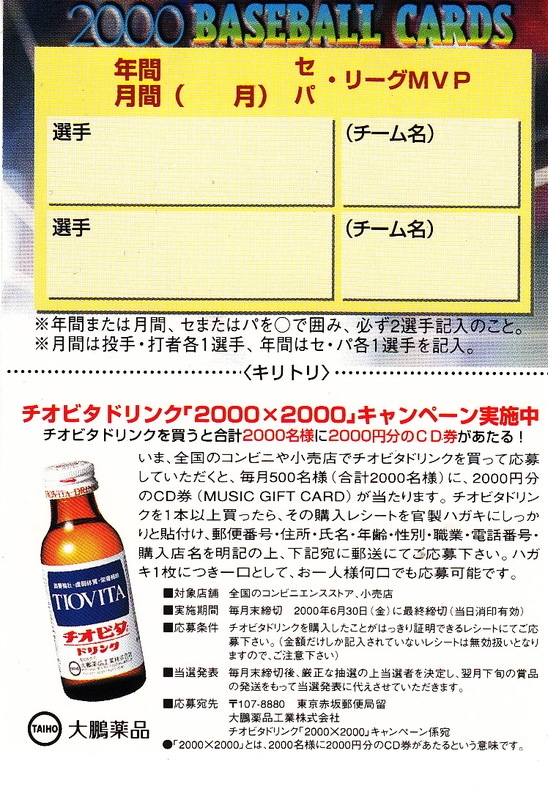 This set only had two subsets other than the Leader subset. 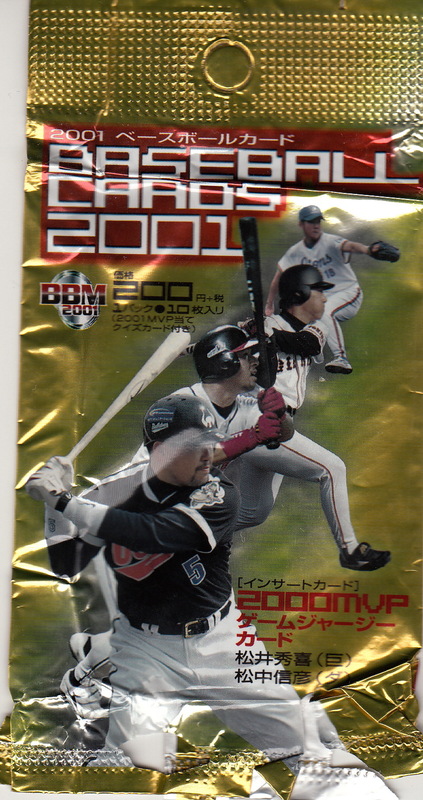 There's a seven card subset called "2000 Memorial Records" highlighting some significant events during the 2000 season. The feats included were the nohitters thrown by Melvin Bunch and Narciso Elvira, Koji Akiyama and Norihiro Komada reaching 2000 hits, Kazuhiro Kiyohara reaching 400 home runs, Shingo Takatsu reaching 150 saves and Tomaki Kanemoto joining the 30-30-30 club. 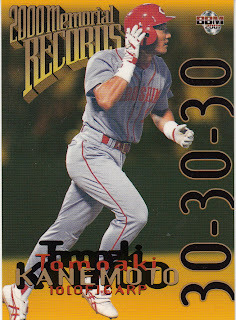 Not quite sure what the 30-30-30 club is - Kanemoto had 30 home runs and 30 steals in 2000 - maybe the other 30 is the fact the he was in his 30s? The other subset features the 14 players who have had their uniform number retired by the various NBP teams (as of 2001 obviously). The players are Fumio Fujimura (Tigers #10), Tsuguhiro Hattori (Dragons #10), Masaichi Kaneda (Giants #34), Tetsuharu Kawakami (Giants #16), Sachio Kinugasa (Carp #3), Toshio Kurosawa (Giants #4), Minoru Murayama (Tigers #11), Shigeo Nagashima (Giants #3), Michio Nishizawa (Dragons #15), Sadaharu Oh (Giants #1), Eiji Sawamura (Giants #14), Keishi Suzuki (Buffaloes #1), Koji Yamamoto (Carp #8) and Yoshio Yoshida (Tigers #23). 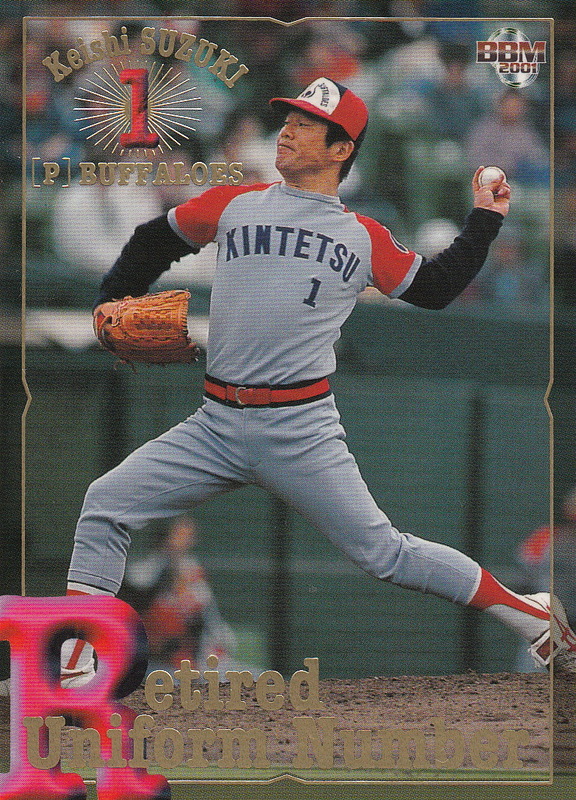 Usually the minor league team for an NBP team has the same name and wears the same uniform as the big club. 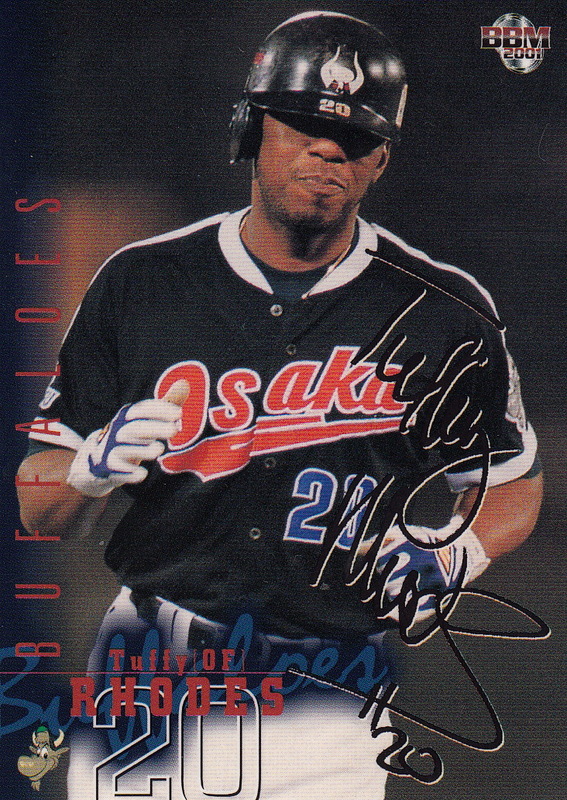 In 2000, the BayStars made an agreement with Shonan for naming rights to their minor league team. 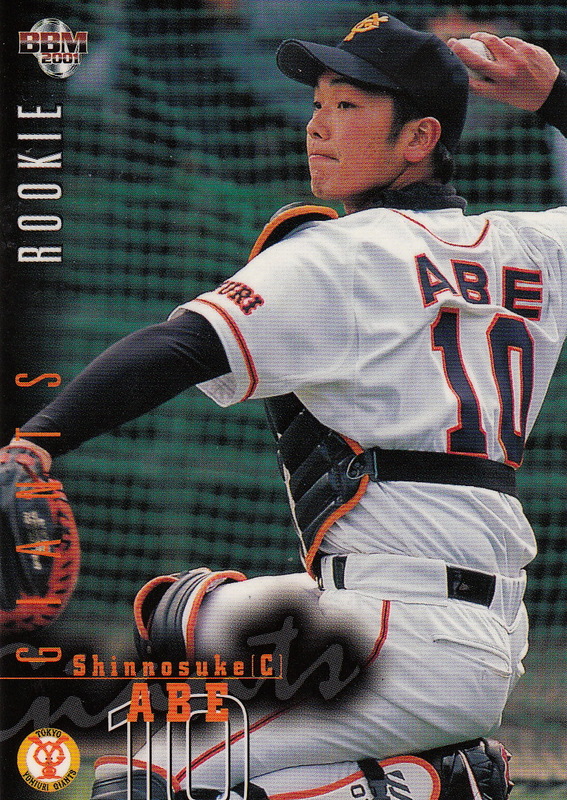 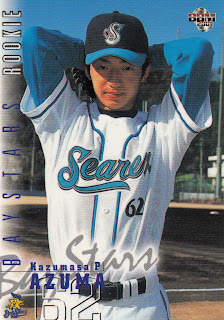 Starting in 2001 and continuing until the naming rights deal expired in 2010, BBM included cards of young BayStars players in Shonan Seerex uniforms. The 2001 set had two parallel issues. 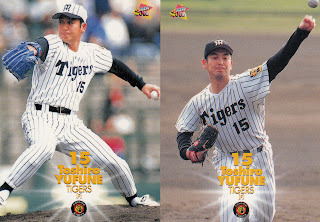 There is a black facsimile autograph version of 127 cards - 28 of which are split between the original series cards for the Tigers and Blue Wave and the Late Series versions. 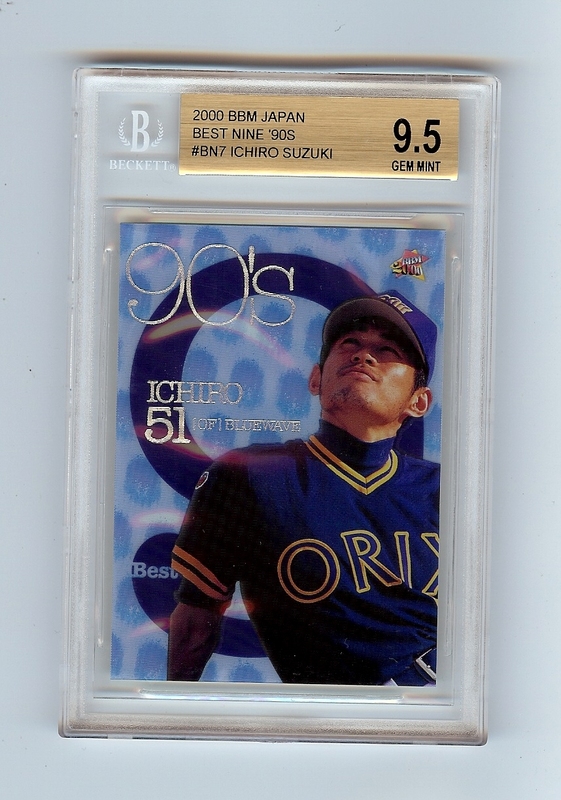 There was also a very limited gold facsimile autograph version of only 12 cards. 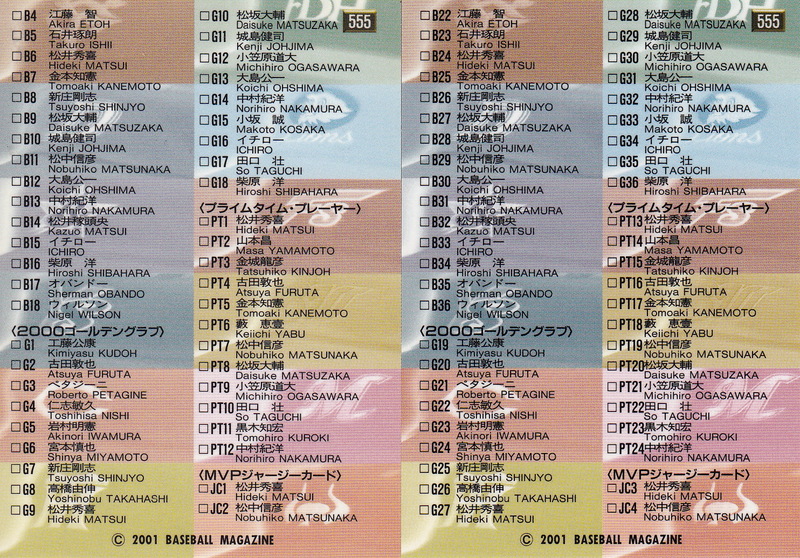 As you might expect, the 12 cards are evenly split between the 12 NBP teams (as opposed to the black autograph cards which are not evenly split between all the teams). 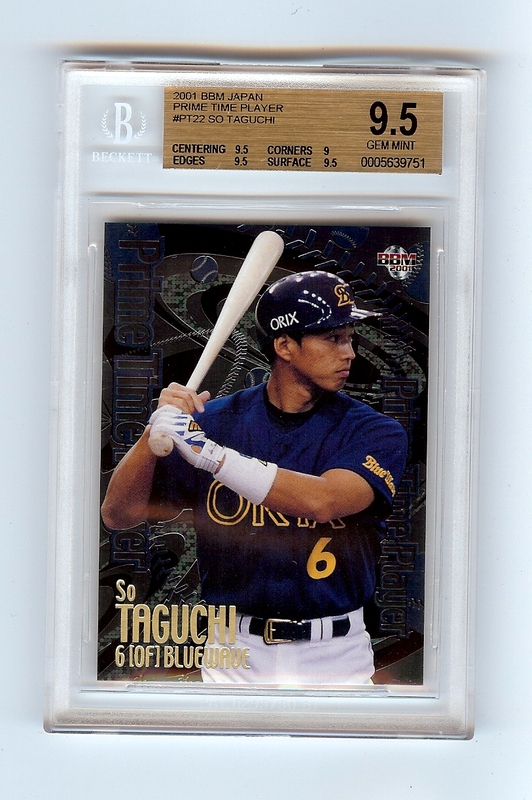 According to Gary Engel's Checklist and Price Guide, the Late Series cards do NOT include the gold autograph versions which I actually find difficult to believe. 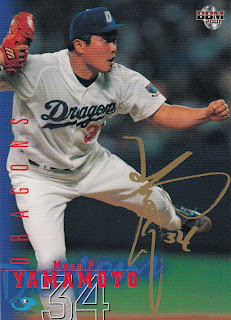 Engel also lists the featured Dragon in the parallel set to be Koichi Sekikawa. 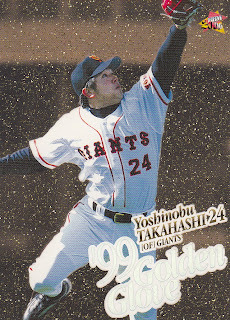 I believe this is incorrect as I have a gold signature version of Masahiro Yamamoto's card. 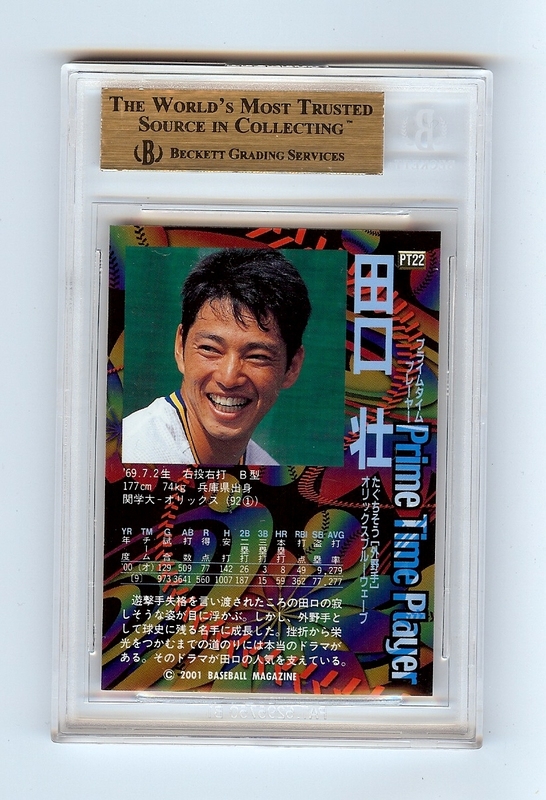 I don't know if it's a coincidence, but the 12 players who have gold signature versions of their cards are also the 12 players featured in the Prime Time Players insert set. 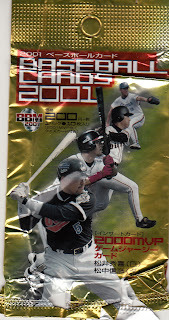 After only including the poster in the 2000 boxes, BBM returned to having both the poster and the information sheet in the 2001 boxes. 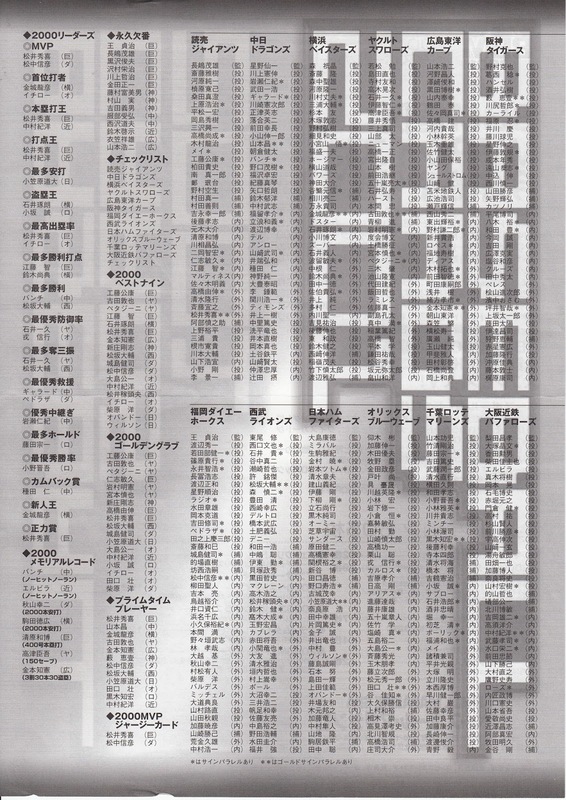 The posters continued to be too large for my scanner so I'm including a picture instead. 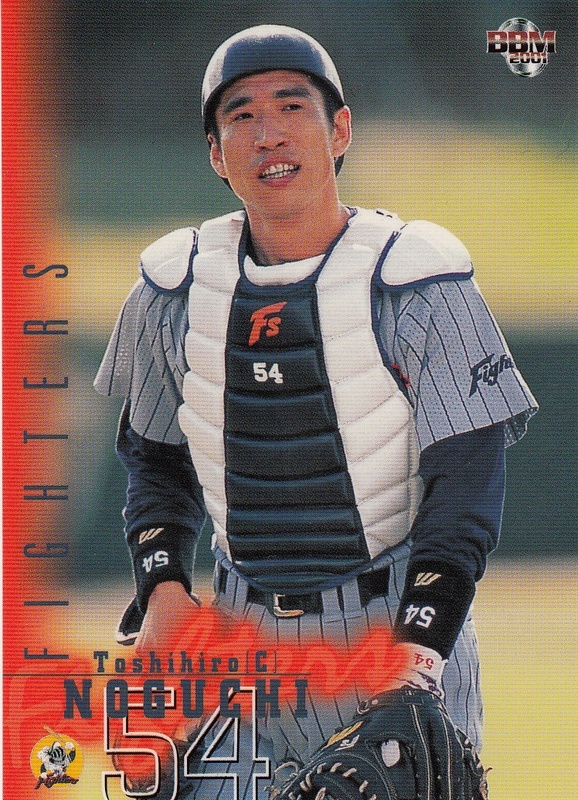 The thing that struck me as kind of odd while watching the TV coverage between the time Akiyama crossed the plate and when his "Hero Of The Game" interview took place, you could hear "Daydream Believer" by the Monkees playing on the PA system at the Seibu Dome. 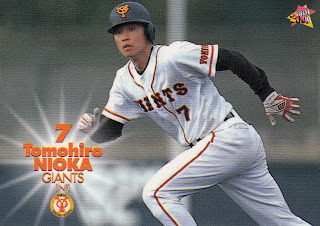 I don't know why, but it just struck me as kind of surreal to hear a 45 year old Monkees song playing in Japanese ballpark. 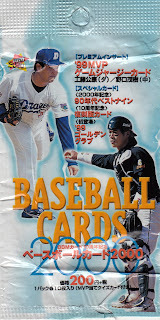 I'm curious who programs the music at Seibu Dome because earlier this season while John Gibson was recording either one of his interviews or one of his Japan Baseball Weekly podcasts at the park, I heard "Tessie" by the Dropkick Murphys (which as a Red Sox fan is one of my favorite songs of all time). 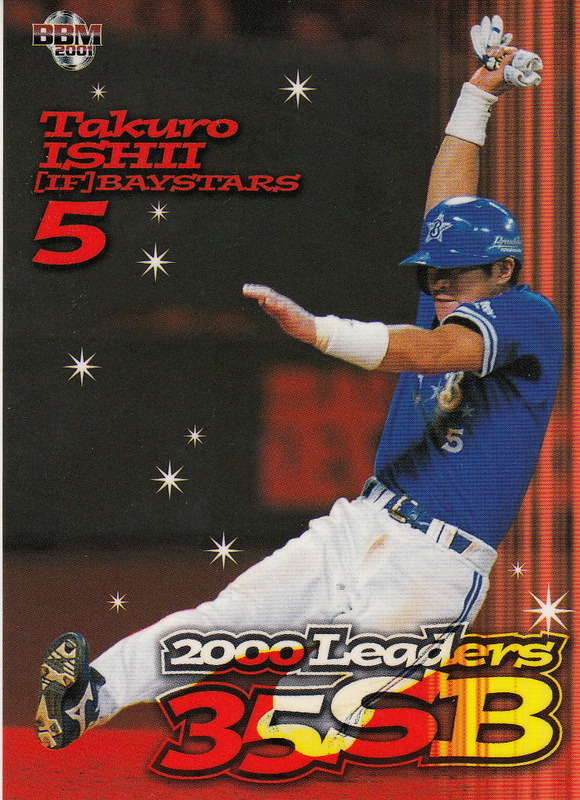 Again, very odd. 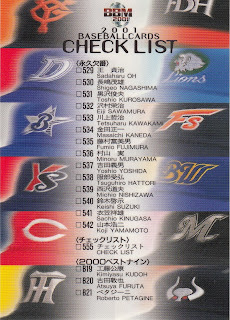 Is it normal for American rock songs to be played on the PA systems at Japanese parks? 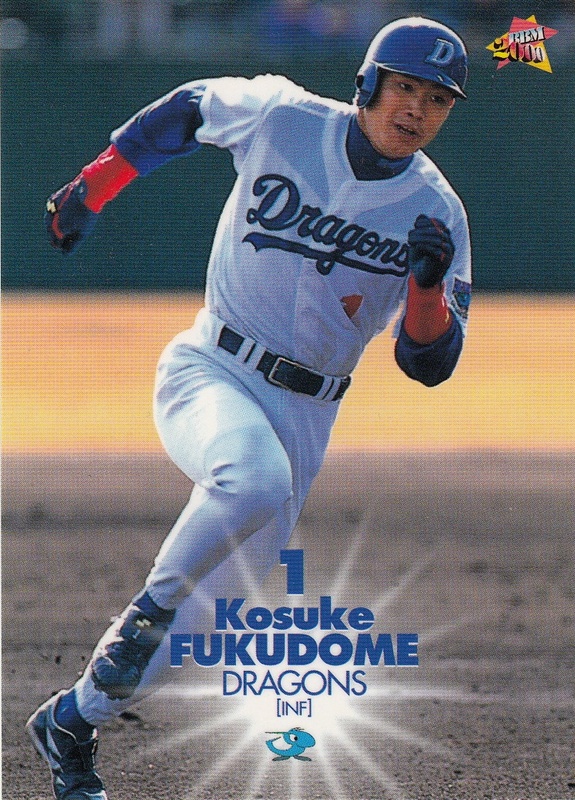 Late Series: Chiba Lotte Marines (cards 549-590 replaced cards 93-112, 333-352, 516 and 539), Hanshin Tigers (cards 591-632 replaced cards 253-272, 493-512, 524 and 547) plus corrections. 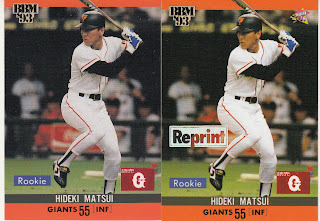 It looks like there was another corrected card, but I don't know what the error in the original card was. 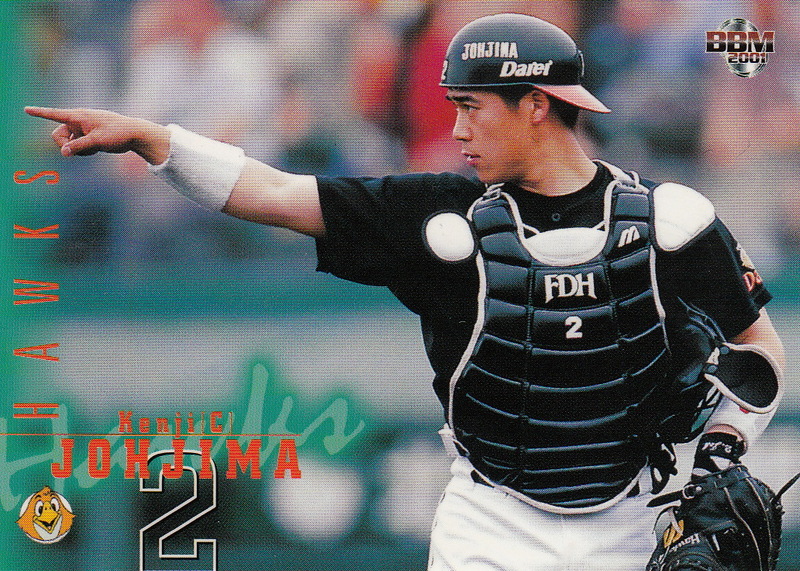 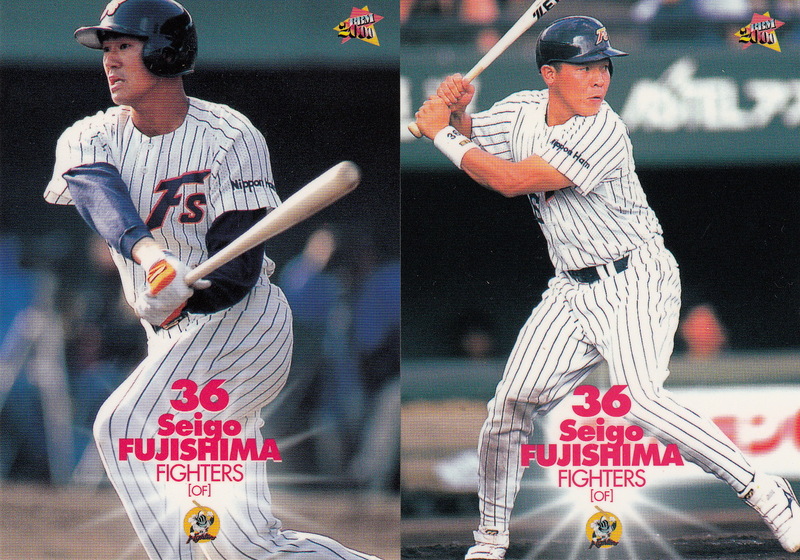 Seigo Fujishima's card was replaced in the Late Series for some reason. I have no idea why - this is not mentioned in the write up of the set in Gary Engel's Checklist. 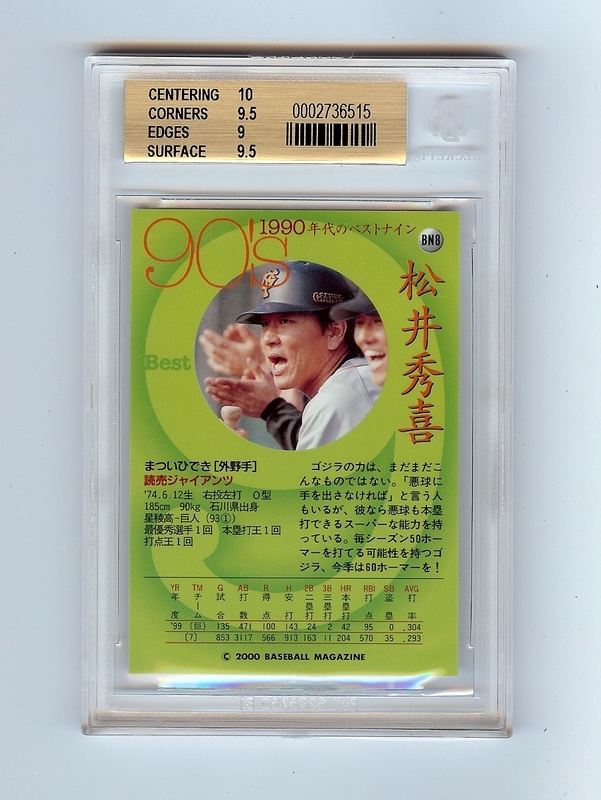 I won't swear that this is the only card like this but it's the only one I've seen. 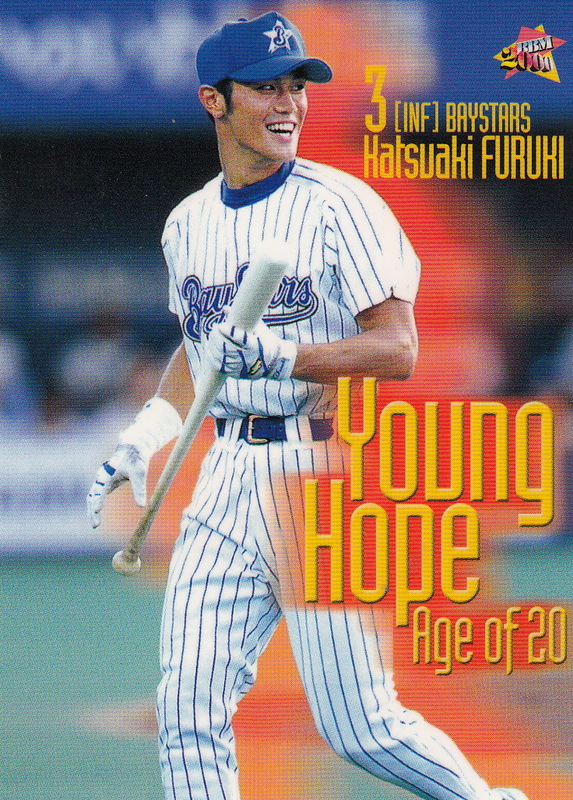 Instead of a 12 card Hot Prospect/Future Star subset that the previous three sets had included, this set featured a six card "Young Hope" subset containing six 20 year old players - Katsuaki Furuki, Akihiro Higashide, Daisuke Matsuzaka, Kazumasa Takahashi, Shiro Teramoto, and Ryo Yoshimoto. 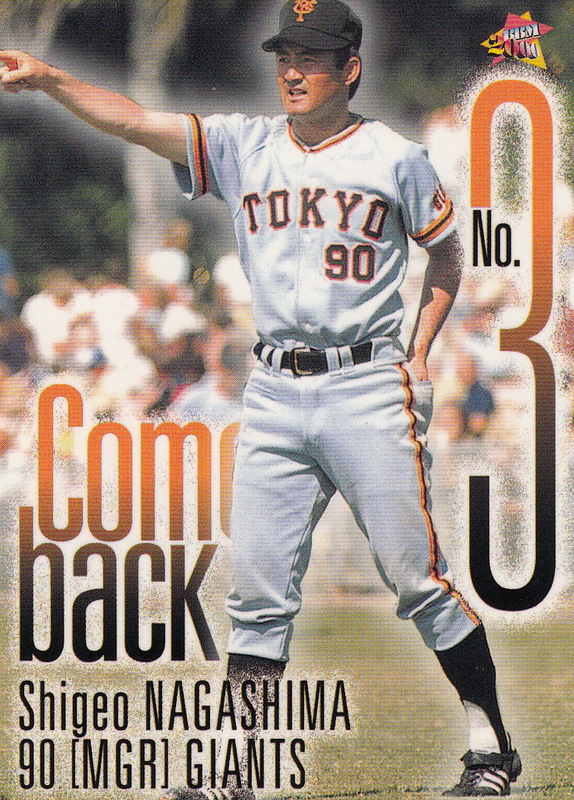 Giants manager Shigeo Nagashima had worn #3 during his playing days. 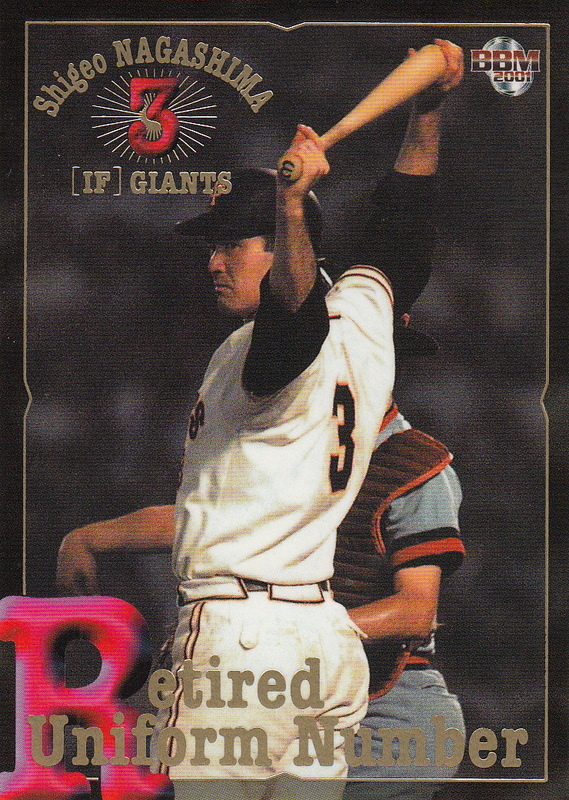 During his first stint as Giants manager in the late 1970's he wore #90. 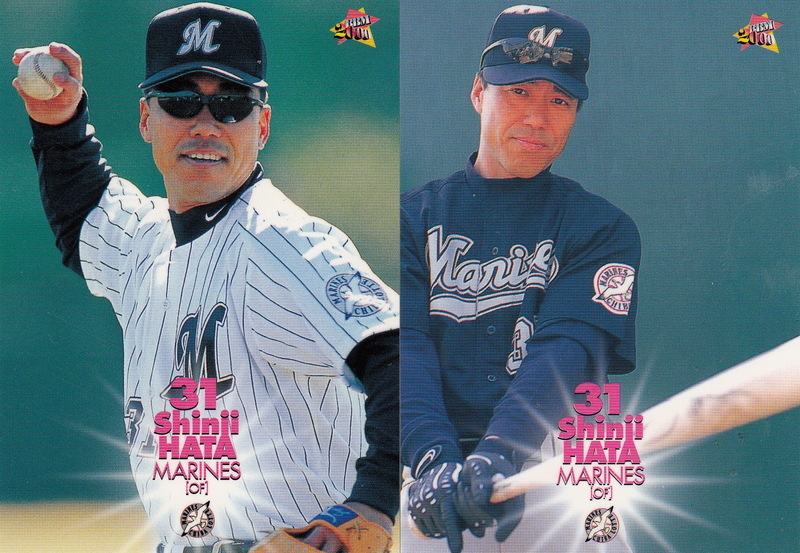 When he resumed that job again in 1993, he started wearing uniform #33. When the Giants wooed free agent Akira Etoh from the Carp following the 1999 season, they apparently worked out a deal where Nagashima would resume wearing #3 so that Etoh could continue wearing #33 as he had in Hiroshima. 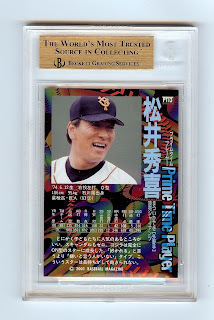 For some reason (probably to have an excuse to do a five card subset for Nagashima), BBM felt this was worth commemorating. 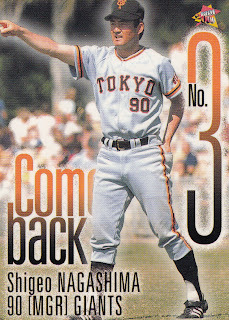 The five card "Comeback #3" subset features two cards of Nagashima as a player wearing #3 and one card each of him as manager wearing #90, #33 and #3. 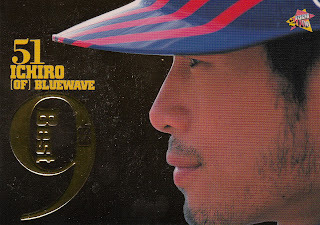 As usual, BBM included an insert set for the previous year's Best 9 winners. 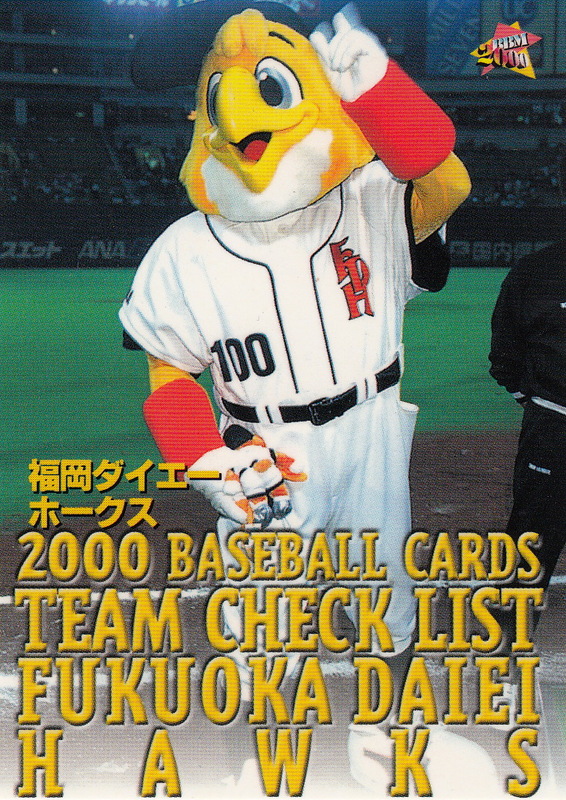 The regular version of the cards feature a "gilded" background. 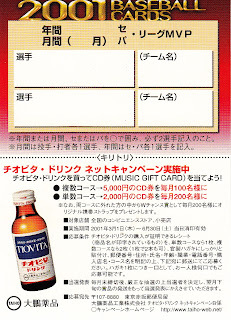 There is another version of the cards that were available to the winners of a mail in contest. These cards did not have the "gilded" background. 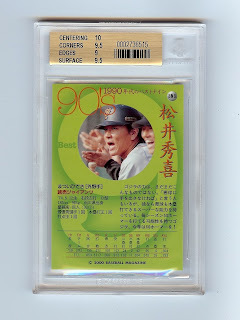 I don't have any of these, but Collecting Ichiro does. 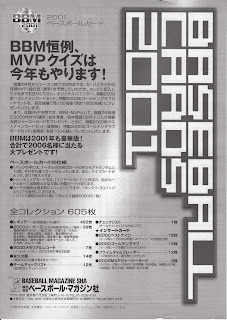 For the first time, BBM added an insert set for the previous year's Golden Glove winners. This would remain a standard insert set for BBM until 2011 when it (and the Best 9 insert set) became subsets in the 1st Version set. 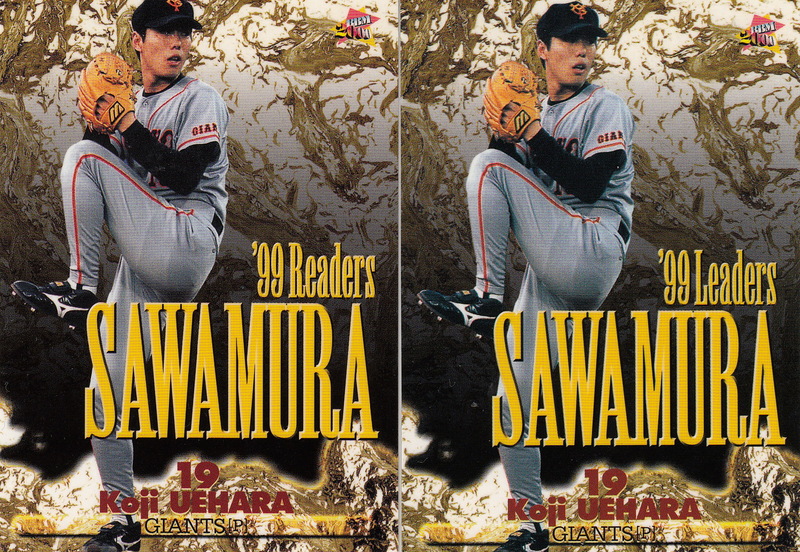 Like the Best 9 subset, there were two versions available - the "regular" version with a gold glitter background and a mail-in contest version without the background. 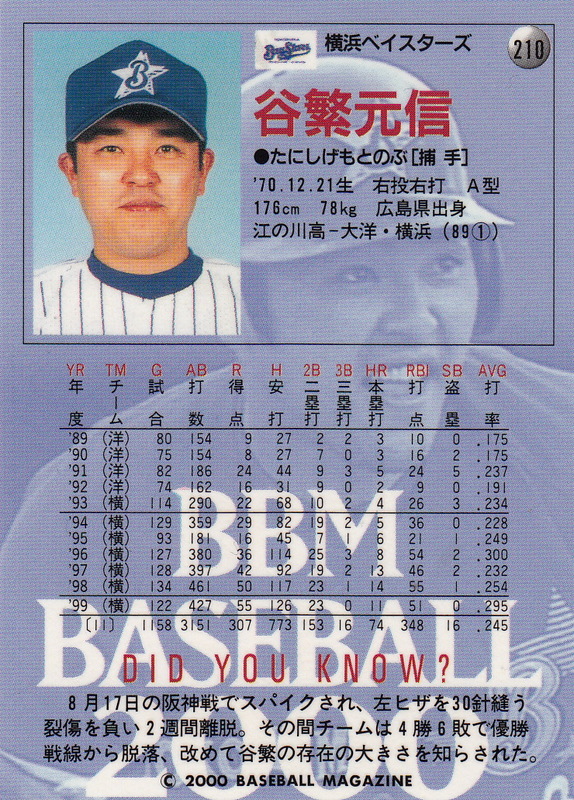 BBM included an additional insert set featuring five players who changed teams following the 1999 season: Akira Etoh, Nobuyuki Hoshino, Hiroo Ishii, Satoru Komiyama and Kimiyasu Kudoh. Called "New Face", they were horizontally formatted cards that showed pictures of the player with both his old and new teams. 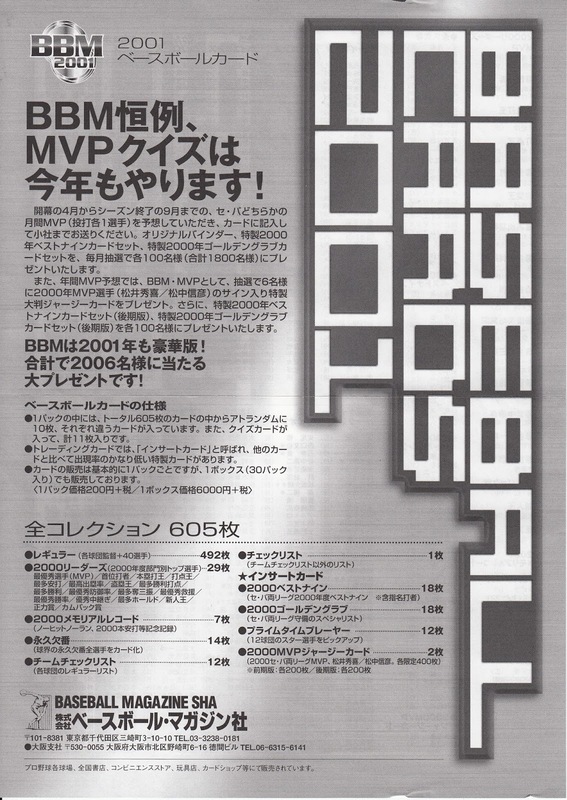 2000 marked BBM's 10th Anniversary. 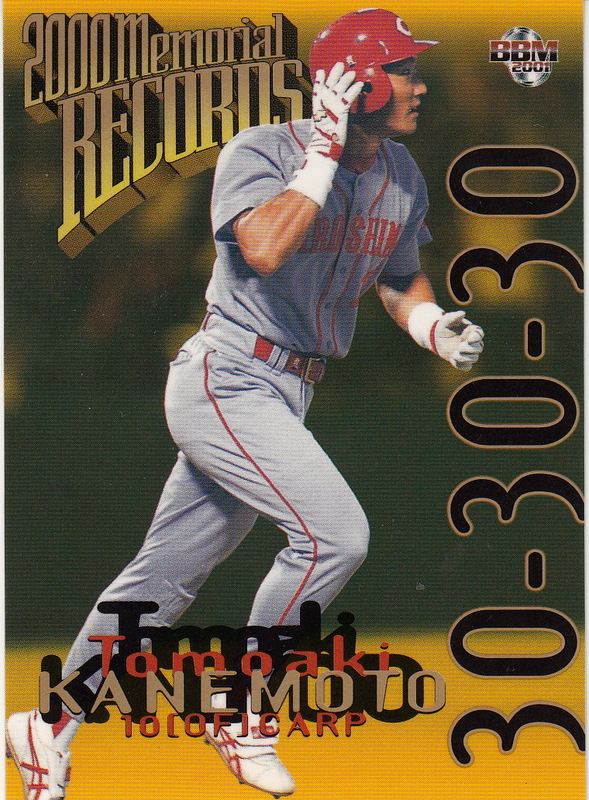 To commemorate this, BBM issued an insert set of reprints of rookie cards for one significant player for each of the 12 teams - Kenji Johjima, Kazuo Matsui, Ichiro, Tomohiro Kuroki, Yukio Tanaka, Norihiro Nakamura, Kazuyoshi Tatsunami, Hideki Matsui, Takashi Saitoh, Atsuya Furuta, Tomonori Maeda and Tsuyoshi Shinjyo. 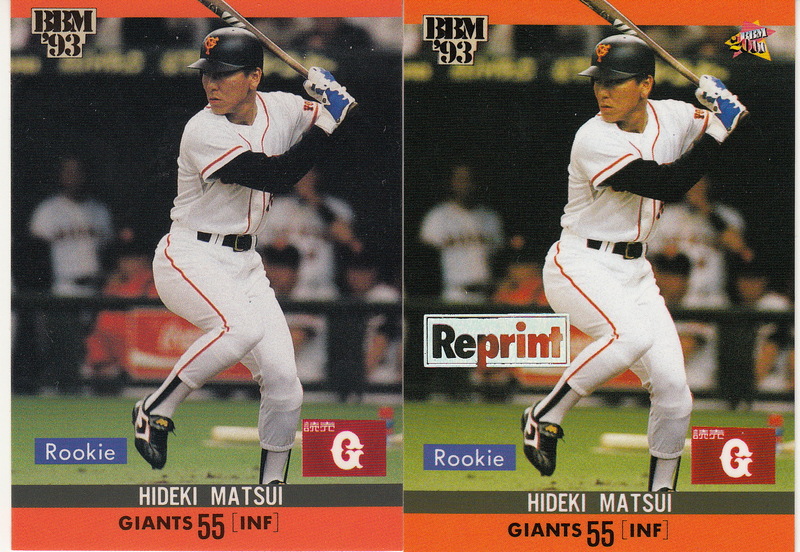 Any reprints of cards from 1994 or earlier are the same smaller size that the original card was. 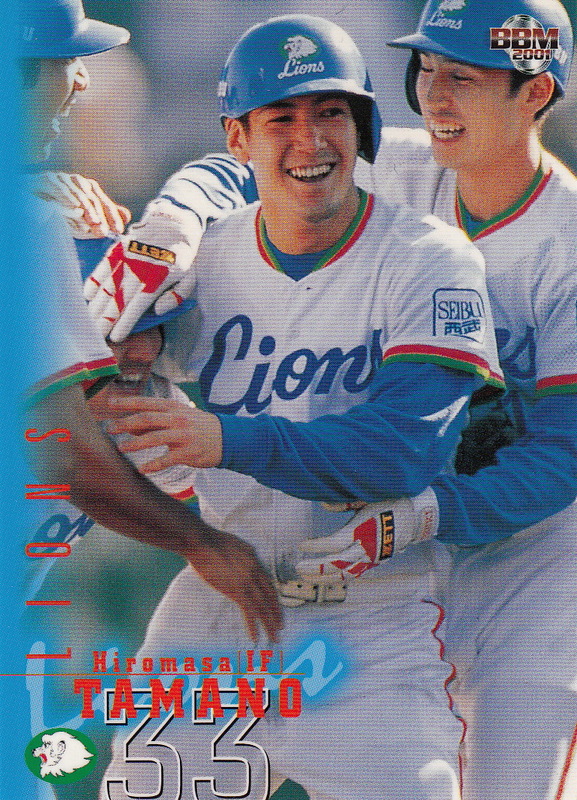 BBM did one additional insert set - the 1990's Best 9. These were plastic coated cards that featured the Best 9 team for the 1990's - Masaki Saitoh, Atsuya Furuta, Kazuhiro Kiyohara, Bobby Rose, Akira Etoh, Kazuo Matsui, Ichiro, Hideki Matsui and Takanori Suzuki. 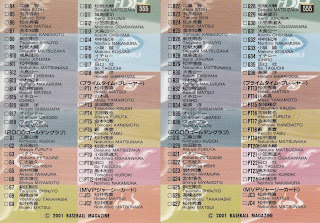 I have none of these to display. 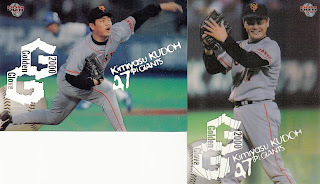 I also do not have either of the available memorabilia cards - jersey cards for the two 1999 league MVPs - Shigeki Noguchi and Kimiyasu Kudoh.